There are seven books in Stephen King’s Dark Tower series. One by one they tell the tale of the gunslinger Roland Deschain and chart his journey to the Dark Tower. He has spent most of his life searching for it. This is the book where Roland’s journey comes to an end and I do not think I will be giving too much away if I tell you that Roland does reach the Dark Tower and finally climbs to the top. What he finds in the room at the top of the tower, I will not disclose. If you want to know that, you will have to read the book. But is the book worth reading? After such a long journey, is the ending worth the wait? To both questions, the answer is yes, but it is possible that a few readers may not like what Roland finds at the end of his quest. 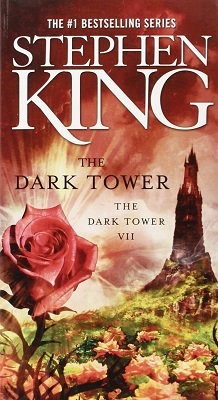 In his afterward, Stephen King states that the story was all about reaching the tower. “You may not like what Roland found at the top,” says King. “I wasn’t exactly crazy about the ending either if you want to know the truth, but it’s the right ending. The only ending, in fact.” I agree with that statement. I had no idea what Roland would find at the top, but I will admit to hoping the Dark Tower might reunite the gunslinger with his long lost love, Susan Delgado. That never happened (say sorry), but the ending does work and in my opinion, it works very well indeed, so well, in fact, that I cannot really imagine the story ending any other way. At the end of the previous book (Song of Susannah), Susannah and Mia—separated at last—were about to give birth to a demon baby that belonged partly to Roland and partly to The Crimson King. Meanwhile, Father Callahan, Jake, and Oy were rushing to Susannah’s rescue, while Roland and Eddie had succeeded in obtaining the vacant lot that was home to the rose and had even spent a little time visiting Stephen King. The final book begins by catching up with Father Callahan, Jake, and Oy, who are outnumbered in their fight against the Crimson King’s minions. Jake and Oy escape alive, largely due to Father Callahan who sacrifices his own life to ensure that his friends can go on. Callahan, formerly of ‘Salem’s Lot, joined the story in Wolves of the Calla and although he fails to survive the first chapter of the final book, he is afforded a last chance to make amends for allowing his faith to fail him, back in the Lot, when he was confronted by the vampire, Barlow. This time Callahan’s faith does not desert him and, no matter how horrible his final moments; he dies a hero’s death. Jake and Oy are soon reunited with Susannah, but her baby has already been born. The child is called Mordred. It is part spider, part baby, and bad news all the way through. It killed Mia within moments of its birth and then scuttled off before Susannah could put a bullet in it. When the kat-tet are reunited they have further work to do—they must put an end to the work of a group of psychics, called the Breakers. The breakers have been recruited by the Crimson King and have only one job: to destroy the beams that support The Dark Tower. Two beams are already gone, two remain. If one of them breaks it will not be long before the final one goes as well, then The Dark Tower will fall, and it will mean the end of all the worlds in every “where” and every “when”. Stopping the breakers is important, but the ka-tet also have another job to do and it is equally important. They have to save the life of Stephen King. All this before they continue on towards The Dark Tower! It’s a busy life when you’re a gunslinger. put the book down for a second or two while I came to terms with what had just happened. Suffice it to say that Father Callahan is not the only good guy who dies in this book, nor is he the only one to knowingly sacrifice his life. I think the saddest thing for me though, is that there will be no more Dark Tower books, but all good things must come to an end; and I can always read the books again sometime. In fact, I probably will.